The media plays a very important role in shaping the public opinion and observes the duty of keeping the masses informed of ‘the state of the nation’. Though onerous to the extent that libel suits are lodged and reporters are man-handled at will, still, the profession of reporting retains its fair share of respect in the public eye. The disturbing trend that is threatening to besmirch the long standing credentials of this respectable profession is the advent of the ‘BREAKING NEWS’ culture. With more and more ‘24 Hour News Channels’ germinating out of nowhere the audience is spoilt for choice. But on the flip side we notice a rising trend amongst all these channels to unnecessarily sensationalize the mundane. Competition has made the producers so morbidly unmindful of their modicum of responsibility that we were catered to a running commentary of a gruesome crime a few days back. Out of the sizeable number of people that I have asked for reaction on it, all have felt repulsed at this outrageousness. Also, people are being gradually inured to the false alarms of ‘breaking news’ by the callous choices of content that follows the flash on the screen. Caution is thrown to the wind as the rush for being the ‘fastest amongst the fast’ dictates false broadcasts which are refuted and withdrawn three times within a matter of a day with shameless ease. Gradually the sensibilities of the people are getting numbed and we find a telling lack of awareness and indifference creeping into us. The curiosity of the perverted is also taken good care of by the ‘peeping Tom’- reporters who stop at nothing to get ‘an exclusive shot’ of the scandals involving starlets. Privacy is compromised naturally, as are limits of decency. I agree that one has to barter one’s privacy for his/her share of fame to rise the proverbial ‘ladder’. Still, a ‘no holds barred’ brand of journalism drastically pulls down the collective standards of morality of an entire society which is fearfully pernicious. As it stands, the MMS episodes have already done enough to expose the wrong facets of stardom and its attendant turpitude. I don’t think we need any more of that in a hurry. We cannot forget that certain things have also changed for the better. We see more ‘sophisticated’ (read good looking and seemingly knowledgeable) people donning suits and contrasting ties reading news. We see a glut of experts on every possible field who are invited to the studio to provide us with hitherto unknown insights into the intricacies of adult suffrage and the game we happen to call ‘cricket’. We are left perplexed as the assembly of journalists report from the remotest corners of the country, interviewing visibly anxious passer bys of their obvious worries and needs. What’s more? All this is brought to us live. We get to know if the Great Mr. Khan got to congratulate the Greater Mr. Bachhan on his birthday and if sea water turned sweet is going to spark off communal tension. We sympathize with the reporter wading through knee deep water with a dilapidated umbrella, trying to drive into our insensitive, selfish minds the plight of the flooded poor in Mumbai. We sit in our couches with bated breath to follow every moment of the gripping advances that the army make to rescue an infant from a well; giving our daily dose of ‘saas-bahu’ sagas a rare miss for the sake of novelty. We also see war-time reporters struggle no less than any jawan on the war-front, just to capture few seconds of sound bytes to take the channel soaring up the TRP charts. We see the elaborate arrangements being made for a gangster’s daughter’s wedding and are informed of how cinematically immaculate his entry would be, considering the fact that the Interpol might be closing in on his heels on this momentous occasion. What we also get to see in our daily lives and never on the screen these days is ‘unpainted, un-engineered and unexaggerated reality’. And anybody hardly cares. Isn't it? And that is why I lament the sad demise of ‘real journalism’ in India. The public inclination towards glamour cannot be denied but, that is only a lame excuse considering the plunging standards of journalism that the electronic media dishes out with impunity. The media comprises ‘The Fourth Establishment’ and its responsibility in maintaining a “vibrant democracy” cannot be overlooked at any expense. It is time that we woke up to our ‘real surroundings’ and pressing needs, rather than attending to the rhetoric being dished to us in the name of ‘news’. To each one of you, my friends, who feel something, move in any nook of your heart after laboring through this article of mine, I would only ask you to switch channels next time any 'polished' news anchor gives you that rehearsed frown while ‘holocaust’ unfolds, and enjoy the timeless episodes of Tom & Jerry on cartoon network.I am sure the latter would be a more rewarding experience to you all. The Ashes is a Test cricket series, played between England and Australia - it is international cricket's oldest and most celebrated rivalry dating back to 1882. It is currently played approximately biennially, alternately in England and Australia. The Ashes are "held" by the country which last won a series and to "regain" them the other country must win more Test matches in a series than the country that "holds" them. If a series is "drawn" then the country holding the Ashes retains them. The last Ashes series was played in England in 2005 when England regained The Ashes after a gap of 16 years by winning the series 2-1. The next Ashes series is going on presently and the next series will be played in England in 2009. The first Test match between England and Australia had been played in 1877, but the Ashes legend dates back only to their ninth Test match, played in 1882. On the 1882 tour, the Australians played only one Test, at The Oval in London. It was a low-scoring game on a difficult pitch. Australia made only 63 runs in their first innings, and England, led by A N Hornby, took a 38-run lead with a total of 101. In the second innings, Australia made 122, leaving England to score only 85 runs to win. Australian bowler Fred Spofforth refused to give in, declaring, "This thing can be done." He devastated the English batting, taking the final four wickets while conceding only two runs, to leave England a mere seven runs short of victory in one of the closest and most nail-biting finishes in cricket history. When England's last batsman went in the team needed only 10 runs to win, but the final batsman Ted Peate scored only 2 before being bowled by Boyle. The astonished crowd fell silent, not believing that England could possibly have lost by 7 runs. When what had happened had sunk in, the crowd cheered the Australians. "In Affectionate Remembrance of ENGLISH CRICKET, which died at the Oval on 29th AUGUST, 1882, Deeply lamented by a large circle of sorrowing friends and acquaintances R.I.P. N.B. — The body will be cremated and the ashes taken to Australia." 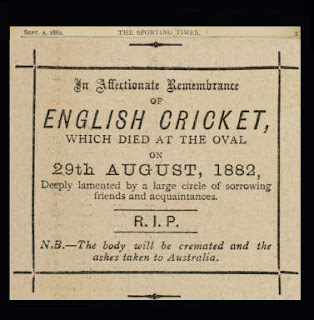 The English media fastened on to this notice and dubbed the English tour to Australia of 1882-83 as the quest to regain The Ashes of English Cricket. A small terracotta urn was presented to the England captain Ivo Bligh by a group of Melbourne women at some point during the 1882-83 tour. The contents of the urn are reputed to be the ashes of an item of cricket equipment, possibly a bail, ball or stump. 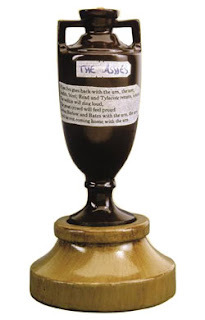 The urn is not used as a trophy for the Ashes series, and whichever side "holds" the Ashes, the urn normally remains in the MCC Museum at Lord's because of its age and fragility. Since the 1998-99 Ashes series, a Waterford crystal trophy has been presented to the winners.